This large gal is light on her feet! 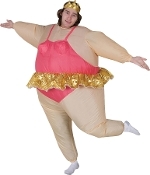 Inflatable costume with leotard look, tutu and crown. Hilarious airblown inflatable costume can turn any adult into a ballet dancer! Outrageous full-body instant unisex costume fits most adults. Includes self-inflating fan with battery pack required to fully inflate and deflate the costume for hours, and a detailed instruction sheet for operation and care of the costume. 4-AA batteries required to power the fan are NOT included. Sized to fit most adults 5-feet to 6-feet tall.